Dan Noyes is the chief investigative reporter for the ABC7 News I-Team. Dan joined the station in May 1994, bringing to local news 13 years of experience in network news and nationally syndicated news magazines. 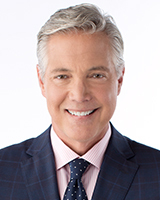 Dan was previously the co-anchor of the ABC7 Weekend News at 6 and 11 p.m.
Dan has been honored with numerous industry awards. The National Academy of Television Arts and Science (NATAS) has presented him with seven Emmy Awards for Outstanding Achievement: Investigative Reporting and Continuing Coverage. The Radio and Television News Directors Association (RTNDA) has honored Dan six times, for Best Investigative Reporting and Best News Reporting in Northern California. Dan also received the RTNDA Regional Edward R. Murrow Award for Investigative Reporting. The Associated Press Television and Radio Association (APTRA) has also honored Dan for Best Investigative Reporting. The Anti-Defamation League has given him the Pursuit of Justice Award. Dan has served as anchor, correspondent and producer, traveling throughout the United States, as well as Europe, Asia, Africa and Central America. He began his career in 1981 at the CNN Bureau in Washington, DC as a producer and correspondent, reporting from the White House and State Department. From 1985 to 1991, he produced for ABC News from Washington, DC, and later, reported for World News Tonight and Good Morning America from the Midwest. From 1991 to 1992, Dan anchored and reported on The West/In America, the nationally syndicated news magazine produced by Kelly News & Entertainment of Sacramento. From 1992 to 1994, he served as senior correspondent for American Journal, the news magazine produced by King World in New York. During his career, Dan has traveled on presidential campaigns, tracked a suspected Nazi war criminal to Germany, investigated the slaughter of near extinct black rhinos in Zimbabwe, and exposed a Bay Area priest for molesting dozens of children. The priest was eventually convicted and sent to prison. Dan is a graduate of the University of Maryland. He's also a member of Investigative Reporters and Editors, Inc. (IRE), the professional organization for investigative journalists, and the Society of Professional Journalists. Pacific Gas and Electric is defending the new picks for its board of directors. The utility's former board chairman appeared before the California Public Utilities Commission late Monday afternoon. Some attorneys who have been filing wildfire lawsuits tell me, this is the toughest stance taken by any judge against PG&E for starting the fires. ABC7's I-Team has an exclusive interview with the acting CEO outside of court. A federal judge singled out PG&E's acting CEO in court on Tuesday, asked him to stand up, and gave him a stern and clear message. What the message was and how the CEO responded.